Casa Grande Hotel (305) 531-8800, (800) 688-7678. Beautiful rooms and all the niceties like turned downed beds with chocolates on the pillow. Cardozo Hotel (305) 535-6500, (800) 782-6500. Singer Gloria Estefan's hotel has large rooms with some ocean views and handmade furniture. 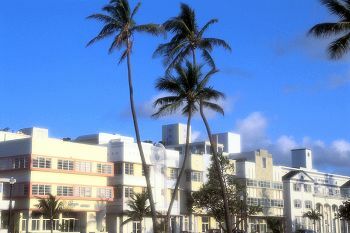 Delano Hotel (305) 672-2800. (800) 555-5001. Popular hotel with the celebrities. Reserve early. Eden Roc Resort (305) 531-0000, (800) 327-8337. Indoor rock climbing, Olympic pool, spa and health club. Fountainebleau Hilton Resort and Towers (305) 538-2000. (800) 548-8886. A landmark on the beach since 1954. Three buildings surround an incredible swimming pool. Every amenity available. Hotel Ocean. (305) 672-2579. Luxury ocean view rooms. Inn at the Fisher Island Club. (305) 535-6020 (800)-537-3708. Room packages include items such as Swedish massages, fitness assessment and other treatments. On Fisher Island. Loews Miami Beach. (305) 604-1601. www.loewshotels.com Brand new towering hotel with 800 rooms and suites. National Hotel (305) 532-2311 (800) 327-8370. Completely renovated Art Deco landmark. Beach location, tiki bar, pool. Marlin Hotel (305) 604-5000, (800) 688-7678. Caribbean style with continental breakfast, stereo and CD collection, bathrobes and beach towels. Raleigh Hotel. (305) 534-6300, (800) 848-1775. Deco luxury, exquisite pool and bar. Tides (305) 604-5070) All rooms face the ocean and telescopes help with stargazing.